How to do market research? The answers to this complex questions can be found in our online guide. After discussing qualitative techniques in our previous episode, we will deal today with the quantitative market research phase (which is the sixth phase of our 7-phase market research methodology). You can find the previous episodes here : Introduction, Phases 1, 2, 3, 4, and 5. What is quantitative market research? Quantitative market research techniques allow you to quantify a research problem. That research problem can be anything: the percentage of customers who intend to buy your product or use your service, the satisfaction rate among your customer base, the assessment of a market share. Most research problems can be answered through surveys. Nowadays surveys are mostly done online. It’s quicker, cheaper and more efficient than traditional paper-and-pencil surveys. Don’t let fool you by the -relative- easiness to conduct an online surey. Besides the practical advice you’ll find on designing your questionnaire, you should pay particular attention to the choice of your respondents. More often than not a convenience sample is chosen (friends, relatives, unknown respondents taking the survey through social media, …) that will deliver unreliable results. This is a very common mistake that entrepreneurs and would-be entrepreneurs often do. You’ll learn nothing but foolish information that way. If you want to obtain reliable results you must have access to a -rather- large sample of respondents corresponding to your target customers. 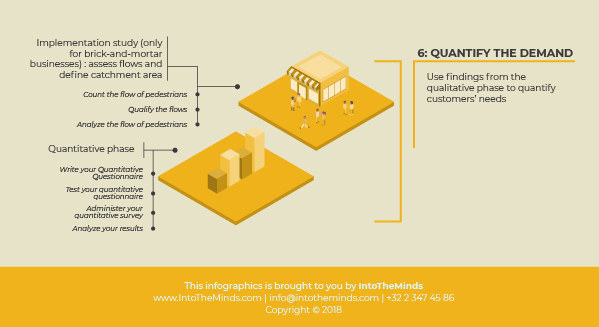 There are many other market research methods that range under the “quantitative techniques” umbrella. Here are two that are perhaps less known in marketing science, yet are very popular in computer science. A/B testing is a method that allows to compare ceteris paribus two or more versions of a website design. Visitors of a website are served one particular version of a website which allows to compare the responses of vert large samples (usually several millions visitors). Large sample sizes allow for significant results. Using data left behind by consumers’ behaviors is another newer way to perform quantitative market research. In B2C markets ad more specifically in online markets firms fo collect a vast range of data that can help characterize their consumers’ behaviors. You don’t need to be a big corporations to have that kind of data. We gave earlier this year on this blog the example of the worlds’ best winebar, the N5 in Toulouse (France), which we are helping through the combination of qualitative research (non-participatory observations) and quantitative techniques (analysis of transactions linked to loyalty cards). The wisdom you can generate out of the combination of such techniques is just mind-blowing. If you want to comment this post, don’t hesitate to do so at the bottom of the page or on Linkedin, Twitter or Facebook.